Anyway, on a clear blue sky early morning in mid-April, Jean-Pierre was resting on a park bench off Leroy Street when he realized just how good he was at giving other people advice, and how it would be wise of him to offer other people help at a time when he too was in such need! Earlier that night he had a long chat with a man in his thirties, whose parents were wealthy and lived on Park Avenue, but who wasted much of his time in the West Village area harming himself. It was that man, who resembled Anderson Cooper who convinced Jean-Pierre that his ability to give good advice was exceptional. Anyway, that pristine morning in mid-April, Jean-Pierre went to a nearby Korean owned 24-hour food store and asked for a piece of light grey cardboard and with a pencil wrote "Free Advice ... Donations Appreciated" on it, and then, having found the most ideal spot around, he sat, cross-legged like a real Indian Guru, atop a coffer-sized metal box that concealed a water-pump in front of The Niagara Falls Laundromat at the corner of Seventh Avenue South and Bleecker Street in Greenwich Village, New York City! The reaction of most people who walked past him that morning was a mix of astonishment, laughter, incredulity and quite a few one and five dollar bills! Few persons actually asked for any advice, and it did not take long for Jean-Pierre to realize that his sign was a major factor in that it failed to best convey the general idea Jean-Pierre had in mind. So he made a much nicer sign, using red, blue and black magic markers and included some basic disclaimers, such as "not a mystic, not a religion" and "not qualified to give medical or legal advice". Thus was born The Original New York City Free Advice Man and the first known person in the History of New York City and America to do such a thing and to become known as The Free Advice Man! India has its sidewalk Gurus, China its Tea House Sages, Native American Indian Nations their Wise Old Chiefs, and so forth, but modern-day America never had its own type of Street-Corner Guru until The Free Advice Man came into existence! Within a few weeks Jean-Pierre Ady Fenyo, The Original New York City Free Advice Man, was a somewhat famous New York City celebrity, starting with his first ever television appearance on WNBC-NY TV Channel 4's Live At Five with Sue Simmons (May 12, 1987), in an interview conducted in-situ by one of New York's finest TV reporters and cameramen, Lloyd Kramer (more recently known for Directing the TV movie "The Five People You Meet in Heaven", adapted from the 2003 New York Times' bestseller book by Mitch Albom) * . During the Spring and Summer of 1987 The Free Advice Man became so famous that on August the 17th, 1987 The New Yorker magazine, New York City's most prestigious historic magazine since 1925, published an article about The Free Advice Man written by one of the greatest of serious American writers since Hemingway, Alec Wilkinson, whose sophistication and style is reminiscent as compared with such literary journalists as Naipaul, Norman Mailer and Agee! It was this article in The Talk of The Town section of The New Yorker that established for all time Jean-Pierre Ady Fenyo as the first, true, original New York City Free Advice Man. The article was later re-printed in Alec Wilkinson's fine collection of compiled writings titled "Mr. Apology and other essays" (published by Houghton Mifflin Company, October 2003, ISBN-13: 9780641890789 ). Side-Note: oddly enough August 17, 1987 is the same day the last remaining prisoner of Spandau Prison (Berlin, Germany), the murderous Nazi Rudolph Hess, hanged himself! Since 1987 The Free Advice Man has given Free Advice to over 100,000 persons directly and to at least 60 million people indirectly, on practically every imaginable topic and issue, except for medical and legal advice! He has sat out in public in New York City, Los Angeles, San Francisco, Washington (DC), Baltimore, Palm Springs, Budapest, London, Brussels, Amsterdam, Vienna, and other places throughout The United States and Europe. He has given Free Advice in front of The United Nations Headquarters, The European Union Parlament, and The White House! He is also a significant Philosopher, a published Writer, Poet and Journalist, and he has given advice to world class leaders, celebrities and other VIPs, including Presidents Bill Clinton, Barack Obama, Jimmy Carter, Vice-President Joe Biden, V.P. Al Gore, several British Prime Ministers and Lords, Nobel Prize winning author Imre Kertesz, Billionaire Financial Genius George Soros, CNN Founder and Media Moghul Ted Turner, the late Science Fiction Grandmaster Author Isaac Asimov, the Genius Inventor of The Rubik's Cube, Erno Rubik, the Film Director Istvan Szabo, World famous Actor Robin Williams, Comedic Actor and Film Director Woody Allen, Israeli President and former Israeli Prime Minister and Nobel Peace Prize winner Shimon Peres, and was during the 1980s a contemporary, personal acquaintance or friend of such notable persons as Andy Warhol, Keith Haring, Jean-Michel Basquiat, Quentin Crisp, Andy Kaufman (The Actor, Entertainer and Song & Dance Man), and many others. Through his advice and media exposure he has had a significant influence on various European and American historical events, including elections in at least two countries. His Philosophical ideas have influenced some of the most influential people of our times. Be sure to watch 'The Free Advice Man Show' on YouTube! The Crackles, a British Progressive Rock Band made a song titled, for and about "The Free Advice Man" ! For more information about this song please contact Jim Guynan of The Crackles. 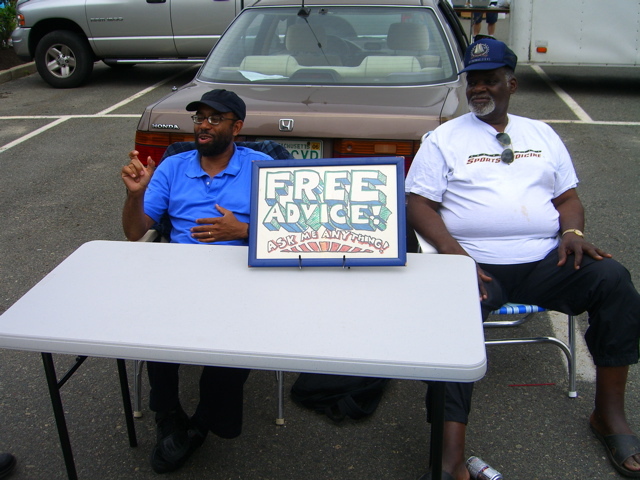 The Free Advice Man has caused a major sociological phenomena to happen, as hundreds of other people around the world today, often not realizing whose idea it originally was, sit out with Free Advice signs! Simply type the words "Free Advice" in either the Yahoo or Google search engine windows, under images, and you will see the proof! Here are a few links to noteworthy examples: Cool Free Advice Dudes ; The Lakeside Advisor ; Free Advicemeisters ; Let Me Tell You How It Really Is Advice in The Park ; Advice Hippies in the Park ; A Politically Ambitious Free Advice Giver ; Cleverly Limited Free Advice ; Free Italian Advice in English ofcourse! ; Free Advice As Bait For Desperate Housewives? The term 'Free Advice' itself is not new at all, and there is a famous song by The Mamas & The Papas, famous Sixties rock band, titled "Free Advice" ! It may be that Jean-Pierre heard this song when he was younger, back in the late Sixties and it was part of the reason, subconsciously, he chose those simple two words. Shortly after The Free Advice Man became famous a major New York City Law Firm used the words "Free Advice" as part of their bus-stop poster ad campaign, and thousands have used the words ever since! Ofcourse The Free Advice Man would have no rights to any royalties. Here are some examples: Risk Assesor Company ; Free Advice Finder ; Advicenators (sounds spooky!). One of the greatest media geniuses of all time, Joe Franklin (of Memory Lane fame), befriended The Free Advice Man and they both spent hours at a time in Joe Franklin's bygone famous Times Square office! The late actor and political activist Al Lewis, known as "Grandpa" (he was Grandpa Munster on the Sixties Hit TV Show "The Munsters") who ran for New York Mayor, also befriended The Free Advice Man, and invited him to sit inside his Bleecker Street Restaurant on a number of occassions. Mayor Ed Koch, who was New York City's mayor at the time The Free Advice Man became famous, actually told The Free Advice Man, in front of a throng of news media journalist and TV reporters that he would never consider giving The Free Advice Man an audience. Bobby...yes! that's Robert DeNiro, one of America's most talented and sophisticated actors and directors...almost fell for three New York City female office workers who plagiarized, without the slightest respect for credit due, the concept of providing Free Advice in public! Fortunately for Jean-Pierre DeNiro was informed in time and the three were dropped like hot potatos. Their advice centered on superficial make-up issues, vanity wear, kitsch hair issues, and "How To Get Rid of Your Jerk" . Not only were they male-bashing chauvinists and copycatters, but they never had the ability to provide the kind of deep and original Philosophical and emotional advice that The Free Advice Man provided with style, grace and conviction! In fact, when they appeared on Oprah Winfrey's Show they turned one desperate caller off and away, someone who was having suicidal thoughts, with the most insensitive of words! Only one of the three women still gives advice to the public, albeit not for free! Unfortunately, their insensitivity put Jean-Pierre at risk of being seriously harmed by people who mistakenly believed him to be the plagiarist! The Los Angeles Times which had published a tid-bit article about The Free Advice Man later reported on this injustice. *In 2004, The Five People You Meet in Heaven was adapted to a TV movie starring Jon Voight as Eddie. Directed by Lloyd Kramer, the film was nominated for a Primetime Emmy. (In relation to Lloyd Kramer). 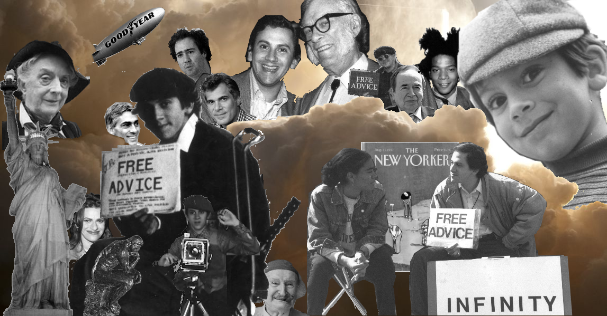 Currently a major motion picture with the working title "The Legendary New York City Free Advice Man" is in the works. It is due for release sometime in 2011. The Free Advice Man, a Philosopher of The Infinite, invented the idea of a special day, commemorated each year, dedicated to Philosophy and Deep Thoughts: Universal & International Infinity Day ! CLICK HERE for more about it. The Free Advice Man currently resides in London, England, and can be spotted at various locations throughout the city, including by Abbey Road Studios, Covent Gardens, Trafalgar Square, Leicester Square, Hyde Park, The Mayor's Office and near Big Ben and The Houses of Parliament. If you're looking for JP's brilliant ideas on Physics CLICK HERE!